The Accreditation Scheme is the UK industry standard for museums and galleries. It helps everyone involved with a museum to do the right things, helping people to access and engage with collections, and protect them for future generations. To read more about the scheme, click here. When does my museum have to submit a return? If you are still unsure, think you may struggle to meet the deadline, or have any questions, please get in touch with Ruth Burwood, Regional Accreditation Advisor. If you are unable to speak to Ruth, contact the Accreditation Assistant at the Arts Council by email or 0121 6315768. A new version of the Accreditation Scheme was launched in November 2018. A Guidance document outlining what is required is available here. 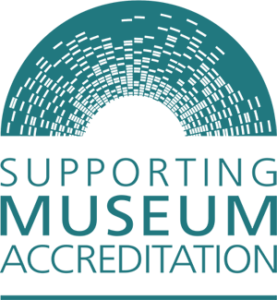 For information on what this means for your museum, contact your Regional Accreditation Advisor, Ruth Burwood. If you have read the Accreditation guidance documents and need further advice and support in renewing or applying for Accreditation you can contact us via the dedicated email at accreditationeast@norfolk.gov.uk. Support is also available at a county level from your local Museum Development Officers. How do I find out more about Accreditation? The Accreditation Scheme is managed directly by Arts Council England (ACE). Detailed requirements on the Scheme, including how to apply along with accompanying guidance can found at the Accreditation pages of ACE’s website. You can also find out which museums in the region are Accredited and which are officially Working Towards Accreditation on the Accreditation statistics page of the ACE website. The 2019 Accreditation Guidance Document to help museums who are applying for the first time, or completing a ‘return’ is available to download here. We need museum staff from all backgrounds to support smaller museums with no professional staff to meet the Accreditation standards. If you are interested in CPD opportunities and the chance to make a real difference to local museums, please get in touch to find out more. To find out if you are eligible, read the Arts Council information on Mentoring here.